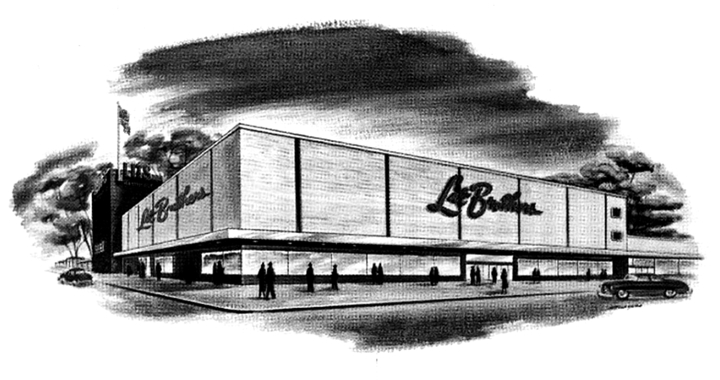 "A Great Store in a Great City"
69th St. & Ashby Rd. N. Pennsylvania & E. Trenton Aves. Oregon Ave & 23rd St. The Lit's at lawrence Park used the early 1960's typecast on the building. 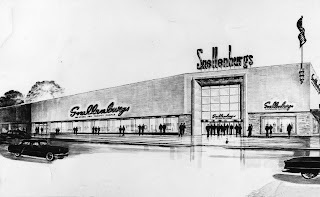 In the mid-50s, Lit Bros. gobbled up another famous Philadelphia store, Snellenburg's ("The Thrifty Store for Thrifty People"). I wonder if you have any plans for adding Snellenburg's to the list of exhibits? Thank you for posting this. 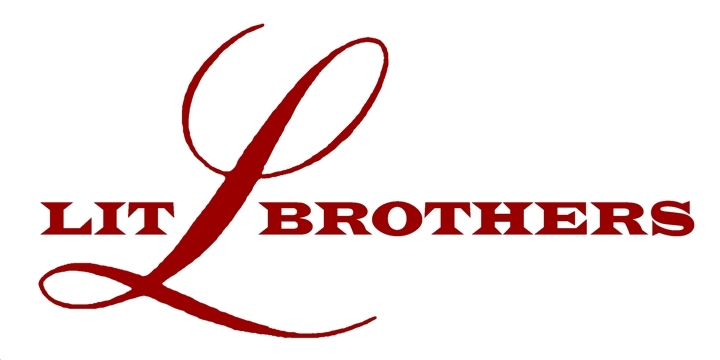 I used a link to this blog on my blog about some Lit Brothers Ephemera. You are welcome. 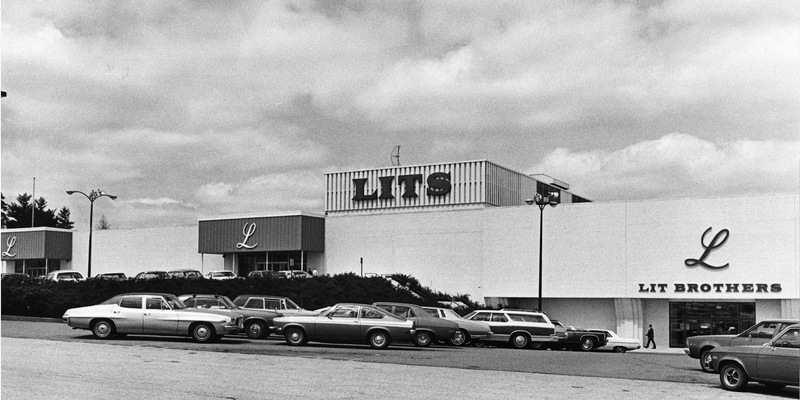 It's sad that Lit Brothers id gone for so long - even in the 1970s, when I first became interested in these stores, Lit's had just closed. It certainly is worth sharing with anyone who has an interest in Lit Brothers, or history in general. 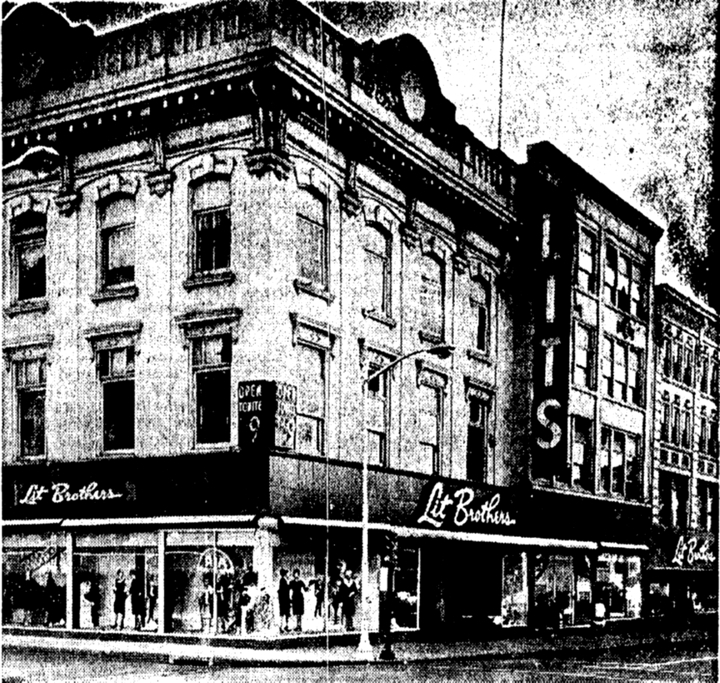 The Plymouth Meeting Lits is now a Boscov's. It was a Hess's for a while before that...I think the original (to Lits) furnishings are still in that store. My grandmother had a Lit Brothers women's wool trench coat with silk lining that she wore everywhere. It was meant a great deal to her. I really want to find out more about this coat but there is not much on the internet. Would you be able to lend some advise on where I would be able to find more information about this coat? 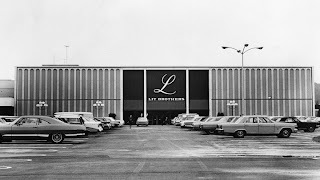 I worked at Lits center city Philadelphia store in 1975 and 76...it was the best place to be at holiday time as that store had the best ever candy department. The Lits at Cottman and Castor also had a very busy candy dept. I can remember people waiting in line to be helped. Did they make their own chocolates? Hi BAK!You forgot the basement at Lit's which was a store within the store which even had its own resturant. Back in the mid 1960s I rememeber the furniture floor was the highest floor customers could go and the air conditioning stopped the floor below. I believe the top floor had a giant auditorium with stage. The company didn't go to separate store inventories until 1965-1966. I have a product (litnette inv human hair net) from lit's &b@ was wondering if anyone had info on it? I have a litnette inv human hair net from lits. Any info on it? 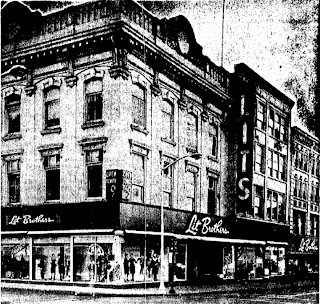 BAK, I don't know if this would interest you, but Lit Brothers is the only department store that is confirmed as having done business with the infamous Triangle Shirtwaist Factory. The sales ledgers are presumed to have been destroyed in the fire; if either of the Triangle's owners had backup copies, they never admitted to it. The only reason anyone knows about the connection is that earlier on the day of the Triangle Fire, one of Lit Brothers' buyers was at the factory. She was called to testify at the trial. Incidentally, the store name is misspelled in the trial transcript as "Litt", thanks to a court recorder a century ago. I've also seen the misspelling on more modern sources, like photographs. 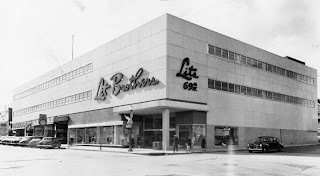 This caused me a sleepless night of research, as it turns out that there was also a "Litt Brothers" chain in Ohio, Kentucky, and Indiana, but it was founded after 1929. I worked for Price Candy Co.selling Charlmont Candies in all of the Lit Brothers stores. I remember going to Lits every year at Christmas. We would go by bus from Trenton and My mom would take us to see the Christmas village. Of course there was a stop at Wanamaker's to see the tree and maybe lunch. 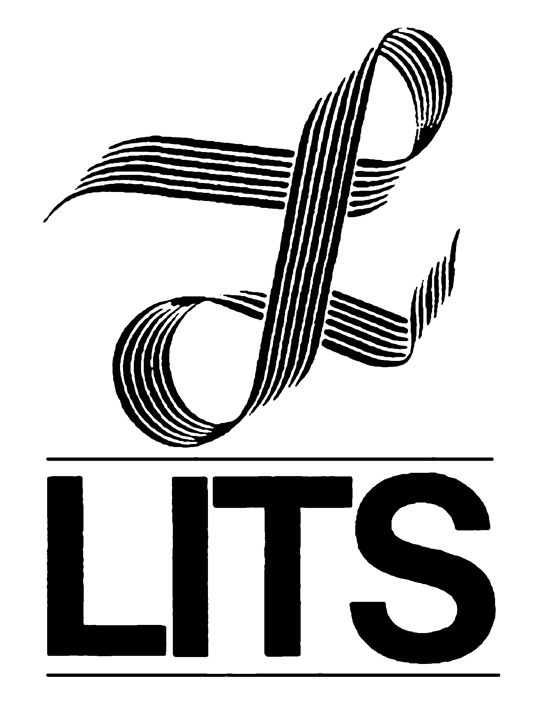 My Grandma worked for the Lits store in Trenton until it closed. I was still young when that happened. I still have really good memories of going there. My father had 3 monkeys that he said were from the window display, 1960, any info? Thank you for putting together this site. 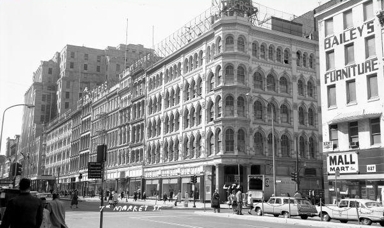 My Dad worked at S&C at 8th and Market for 45+ years, was the silver, glass and china buyer. We used to watch Santa climb the fire ladder into Gimbels from Dad's office in the S&C building. I remember the first year in the Gallery and they removed a huge white panel in the wall of the Gallery to allow Santa to climb in. I am now in an office on the 5th floor of the Lit's building, does anyone know if this was a retail floor or an office floor, the office overlooks 8th street including the corner overlooking the old Gimbel's site. 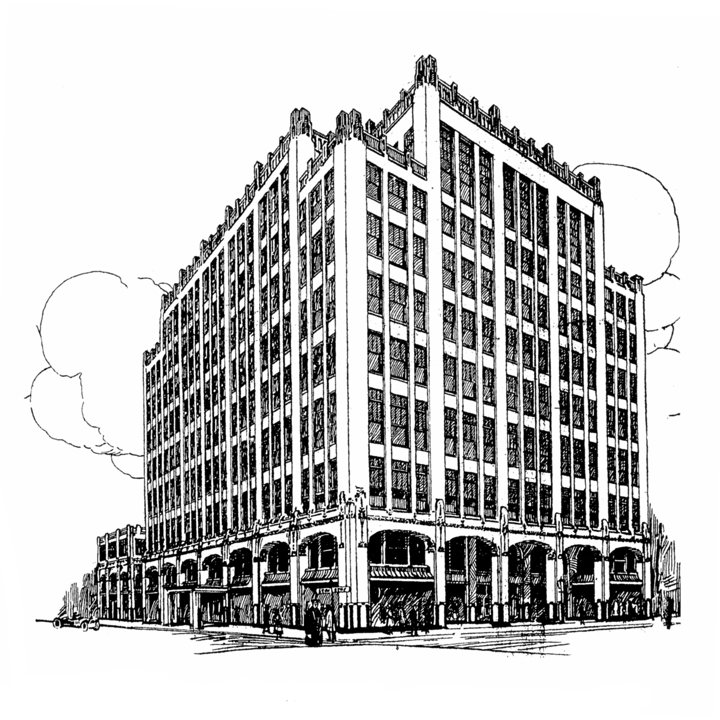 Yes the 5th floor housed the executive offices.It was beautiful,and was called Magahony Row. The Lit Brothers store was in Morrisville PA not New Jersey. 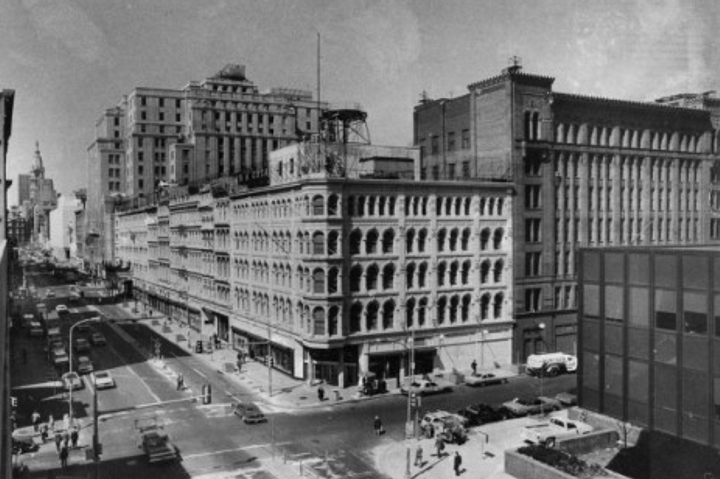 My Dad worked in the federal building at 9th. and Market,over top of the post office. We used to sit outside on the balcony and watch Santa climb up the ladder and go into Gimbels at the Thanksgiving day parade.About 1948.They were great times. i have a beautiful sequin blouses with the Lit Brothers tag on it. any information you can give me on it. It weighs at least a 1/2 pound. Does anyone remember a Lenny Max the Northeast store manager in the 70's? I worked at Lit's Beginning in 1967 in the 8th and Market store as a stock boy in the women's fashion shoe department, later becoming a salesman in the same department. But the real fun began in 1969 when I became a store detective also occasionally serving as a night watchman when the regular guy was off. I knew every inch of the store and had a tremendous amount of fun working with a great bunch of people that became great friends. The work was sometimes dangerous as I was shot at by a fleeing shoplifter and became embroiled in many physical struggles while apprehending thieves. The then Police Commissioner Frank Rizzo, who often lunched at the Jefferson room observed me struggling with a thief and assisted me in controlling the guy. He asked me if I knew who he was and I said that I did. A few years later Rizzo became mayor. My father was the last employee of Lit's doing security work and lasting until 1980. Thanks my father worked for lit brothers for 27 years and never got a pension because they closed there doors. Nice site! Does anyone know what became of Jacob Lit's widow, Gladys (Carruthers) Lynch - Lit? I know she was about twenty years younger than her husband who died in 1950. She may have died shortly after her husband. I am trying to find Gladys younger sister, Helen Carruthers. Thank you. Can anyone tell me more about the great Christmas train layout I vividly recall from my childhood at Lits Market St store in the 1970s, it was on the ground floor grand court and was spectacular, but most research rarely comments on it focusing mostly on the Christmas Village. What happened to it after Lits closed? I wish someone would set one up again there. 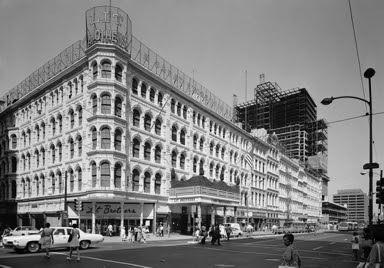 Does anyone remember the Jefferson Room restaurant at the center city location? I worked in the advertising dept. 1969-1971. 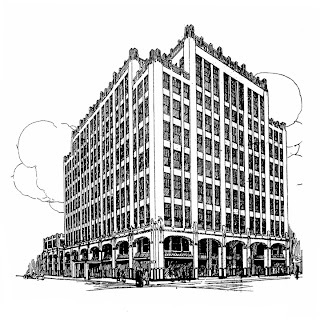 It was on the fifth floor, just down from the mahogany offices, but rather decrepit. We used to eat lunch in the Jefferson Room and that's where I first had a chef salad. It was huge. We sometimes went across the street to Strawbridge's. It was my first experience in a big city and I loved it. My memory of the Jefferson Room was that it was by the men's dept. Somehow, I always thought it was on the first floor. In 1974 or 75, they had a kids' ''Shopping Bag Special'' For a dollar, you got a little shopping bag with a hot dog, drink, chips and a little plastic Snoopy. I still have the Snoopy. I remember getting open faced hot turkey platters before that. It came with ''Ambrosia Salad''. It was iceberg lettuce with cranberry sauce, mandarin orange slices and shredded coconut on top. One time my father ordered a corned beef sandwich. He sent it back because it was so skimpy on the corned beef. The restaurant had a colonial theme. I can't remember of it was painted light blue, then, changed to light yellow or vice versa. My Grandmother used to take us to the Christmas Village in downtown Philadelphia every year when I was a kid. We would always eat lunch at the Jefferson Room Restaurant where I got my annual BLT, no tomato on toast and a red jello with whipped cream. That was back in the 1960s and was always the highlight of my year. I loved riding the subway and seeing all the beautifully decorated store displays. What wonderful memories! In my memory, the Jefferson Room was on the first floor by the Men's dept. Was it on the first floor? Yes, it looks like to Colonial-style restaurant was dedicated in October, 1961. I have a Hallett Davis floor model phonograph that was sold by Lit Brothers in 1922, does anyone have additional information? My father Bernard Litvak was president of Lits in the Fifties and Sixties. He oversaw the expansion into the suburbs, as I recall. When I visited on some weekends, we would walk through the competitors' stores to see what they had going. I have a Lit Brothers Million Dollar Lit Day Coin dated Oct.5th 1931 with the Philadelphia pictured . Does it have any value ? 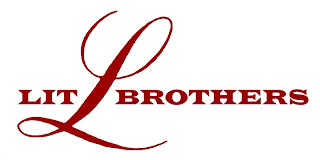 I modeled for Lit Brothers in the late 1950's. My grandmother worked in the fur dept. Thanks for posting this! I was a little girl when Lits was still there and had their wonderful Christmas village display; my, what a wonderful thing that was! 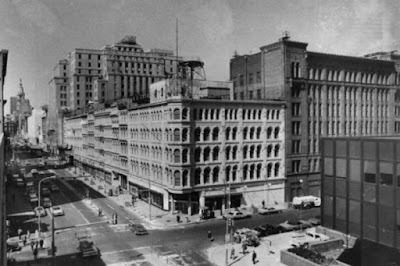 Thanks for your insight - I also feel that without the great department stores, uniquely beautiful hotels, popular (and often "continental") restaurants (maybe with dancing, even), and spectacular film theatres, you are absolutely correct: "downtown has no special meaning whatsoever." It's true. You are very welcome. I am glad someone remembers Lit Brothers! 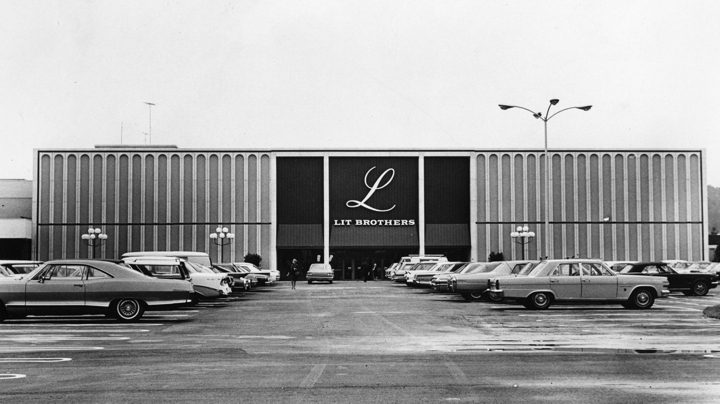 I grew up a mile from Lit Brothers at Echelon Mall Voorhees NJ. My mom worked there too. Before Lit Brothers occupied the 8th and Market location, J.B. Lippincott, a publisher, occupied that location, there was a fire before Lit Brothers ever occupied the space. Lippincott was the original publisher of To Kill a Mockingbird. They are still publishing today, although the name and owners changed a few times. I know all this as I have worked for Lippincott since 1996. Coincidentally after Lit Brothers closed, a bar named Market Street Live occupied the lower level of the former Lit Brothers location. I met a man there in 1991 that became my husband and we have been married over 21 years now, the same building that the company I would work for for 20 years was formally located in. Anyway, I have a special love for Lit Brothers. I have a gift box and a Stock Certificate I saved too. anything on EJ Korvettes or S.Klein's 'on the square' in Philadelphia, PA? I came across a White sewing machine that was purchased from Lit Brothers as a Valentine's day present in 1950. I restored it and it has all the original accessories including owner's manual, instruction manual, and warranty paper. I have it for sale. Perhaps, the museum would like to have it back. So far I have had offers for the accessories. I really do not want to seperate it and want it to go to someone that will appreciate the history. 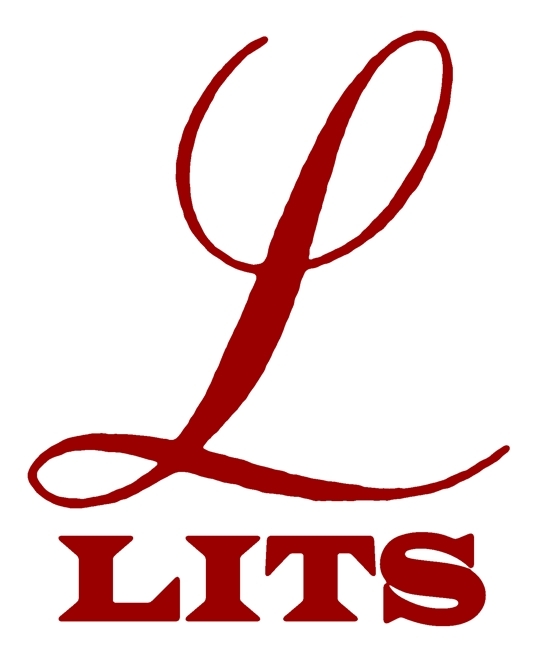 My father worked for Lit Brothers in the late 1940s, early 1950s. I think I remember a "Magic Lady" at Christmas in a beautiful snowy setting. Anyone remember anything like that? And was there a small train that you could ride that ran around the ceiling? Or was that some other store? I believe it was Wanamaker's that had the monorail you remember . . . but I'd have to look into the newspaper archives to see anything about the "Magic Lady." I WAS BORN AND RAISE IN CAMDEN NJ AND REMEMBER THE LIT STORE DOWNTOWN. THANKS FOR THE COMMENTS THEY HAVE BROUGHT BACK GREAT MEMORIES. Hi, I remember my Mom taking us kids, four of us, down to Philly from Lower Bucks County back in the late 1940's, to shop at Lit Brothers and have lunch at Horn & Hardart's. Funny thing is while researching my family history I found out my 3rd great paternal grandfather, Christian (Lorentz) Lawrence 1764-1811, had a blacksmith shop in 1790, where Lit's was located. My Dad would have loved to know that. Thanks for creating this site. Love reading about Southeastern Pennsylvania life way back when. Site is nice! My Mother worked at Lits - Phila. in the late 1920's to 1930's. She met my Dad there who was an electrician. Her sister also worked at Lit's until it closed. I remember taking a bus and the "EL" downtown in the early 1950's. My Mom loved going to center city. Unfortunately I don't remember much about the store.